There are a few things about camping that just give you that satisfying outdoorsman feel. 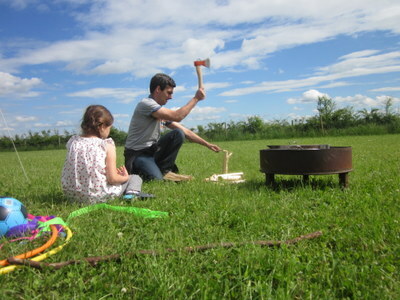 Yes, during the week you may be a computer programmer, stay at home mum or part time blogger but once you hit that campsite you become intrepid explorer, woodsman, botany expert Ray Mears! In order to properly facilitate this transformation you are going to need some ‘tools’. 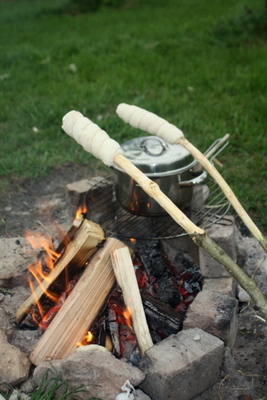 The campfire brings out the cave dweller in all of us, and the preparation is half the fun! Get yourself a good hatchet. Oh the satisfying THUNK of good quality steel splitting those well seasoned logs. Now to lighting that fire. Lighter fuel? No way. It has to be fire steel and some real satisfacttion! Now what about a bit of wood craft? A stout hazel branch makes a brilliant walking stick, so how about a lovely folding saw to cut the branch. Overkill? No way, you will find plenty of uses for it. For instance, you could use it to cut elder branches and makes some elder bead necklaces plus it is a very useful pruning tool for back home in the garden. You really DO need one and this is the actual one ray himself uses (apparently). There, now you are well on your way to becoming Ray Mears. Go forth and be at one with nature.